Danish architect Dorte Mandrup has planned a building on top of a second-world-war naval bunker, in a UNESCO World Heritage area on the German coast. 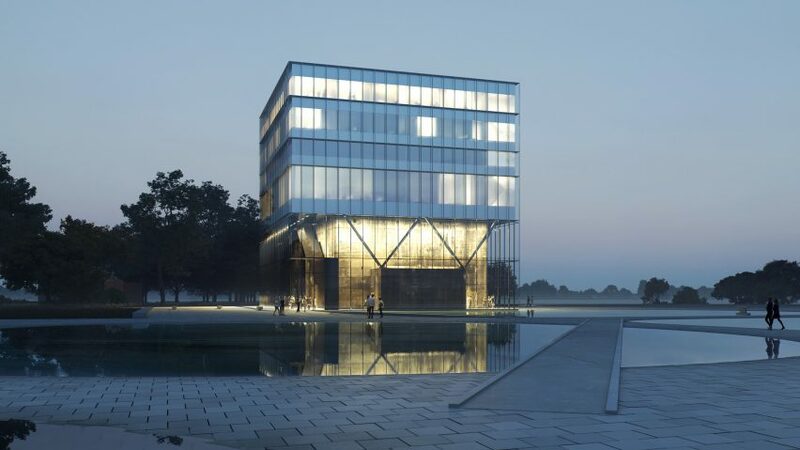 Dorte Mandrup Arkitekter's competition-winning design places four storeys of office and storage space above a historic former military building in Wilhelmshaven, and wraps a glass wall around the exterior. The project was winner in a contest to design a new headquarters for the Trilateral Wadden Sea World Heritage Partnership Centre, an organisation jointly run by Denmark, Germany and the Netherlands, which aims to protect the Wadden Sea area. At ground level, a single layer of glass will ensure the existing structure remains visible and enclose a sheltered space that will be used for exhibitions and events. This space will be illuminated at night. "We will integrate the heavy bunker in the new building, and by doing so, use as little land resources as possible," said the Copenhagen-based studio. "At night-time the building expresses itself as a lighthouse, in the daytime it resembles the reflective surface of the Wadden Sea, that again is reflected in the surface of the rainwater pools." The four storeys imposed above the bunker will be used as meetings and conferences facilities, storage, and offices, with a common sheltered terrace overlooking the Wadden Sea on the building's roof. A staircase will directly connect a side entrance to the new building. The Wadden Sea area is the world's largest unbroken system of intertidal sand and mud flats, and was listed as a UNESCO World Heritage site in 2009. In 1853, the area was established as a Prussian naval base, which grew to become Wilhelmshaven. The town sustained heavy bombing during the second world war and the bunker is all that remains of the site's naval history. The competition to design the centre was held by the town of Wilhelmshaven, with the project is co-funded by Germany's Federal Ministry for the Environment, Nature Conservation, Building and Nuclear Safety. Dorte Mandrup's studio previously completed another project in the area – an extension to the visitor's centre on the Danish side of the Wadden Sea area, featuring a sculptural thatched roof. Other recent projects by the Danish studio include a climate research centre in Greenland, with a tent-like structure that forms a viewing platform for observing icebergs, and an observation tower in Aarhus harbour.